Cameroonian widows suffer from AIDS disproportionately. CAFENEC also looks after orphans. Among the orphans are AIDS sufferers, those who are otherwise sick or epileptic, and those who are disabled and without support. Cameroon faces the highest prevalence of AIDS in Western Africa. 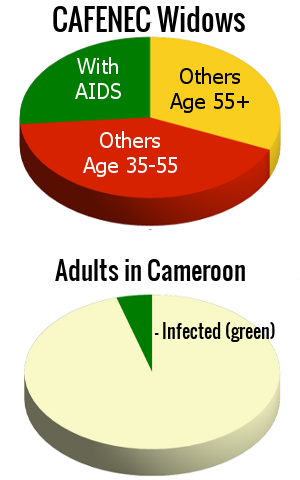 According to UNAIDS, nearly 5% of adults in Cameroon are infected. The country suffers the tenth highest number of AIDS deaths in the world every year. Cameroon has laws against AIDS discrimination. And, the government has made strong efforts to make treatment accessible to everyone. For example, antiretroviral treatment has been free in Cameroon since 2007. But, stigma and discrimination stand as the greatest obstacles in the fight against the disease. This causes many infected people to avoid treatment. Why Do So Many Widows Suffer from AIDS? Throughout sub-Saharan Africa, twice as many young women (age 15-24) live with HIV as young men. Many widows have also been widowed by AIDS. These factors all contribute to the very high infection rate among them. CAFENEC recently celebrated International Widows’ Day on June 23, 2014. In previous years, during their campaign “Humanize Widowhood Rites”, all the widows came to celebrate. This year, CAFENEC had very limited financial resources. Not all the widows could attend. Around International Widows’ Day, CAFENEC hosts workshops for the widows. Discussions are held raising awareness about the rights of widows, training, and education. CAFENEC gives each widow the opportunity to express themselves without fear. During annual discussions, they realized that widows do not know their rights and obligations. Widows continue to lag behind in terms of education about their rights, training, and access to resources of everyday life. Many are stripped of their own property, their inheritance, and entitlements after the deaths of their husbands. Without the benefit of the deceased’s pension, they find themselves poor, unfortunate, and reduced to begging to raise their children. To raise national awareness and public opinion on the situation of widows, in the context of high visibility and better management. To establish a platform for exchange with widows, their children, and widows’ support associations, and to lay the foundation of an action plan to support their concerns. CAFENEC’s board of directors has six members, all women. The organization has 75 active members, including counselors and many volunteers. One in five members have no financial means to pay their dues. If resources permit, partner organizations involved in widows’ conferences should create an African Synergy against widowhood rites in Africa. Working together will massively raise the awareness of leaders, which in turn will restore the smiles and taste of life for African widows. Please see the contact information for CAFENEC here. Posted in News and tagged AIDS, CAFENEC, Cameroon, orphans, UNAIDS, widowhood rites, widows.